We know what you're thinking: I‘ve been grilling for years and have never had a gas leak. While they aren't common, gas leaks do happen and they are most usually the result of a loose connection or damaged gas hose. And as the saying goes, it is better to be safe than sorry. How Often Should I Check My Grill? We recommend that you test your grill for gas leaks at the start of each grilling season. 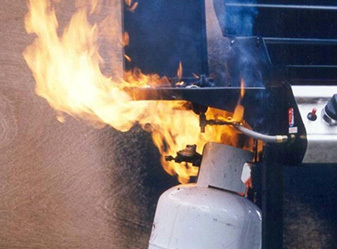 If you use a propane gas tank, you should also check it every time you replace the tank. And if you're using a natural gas tank, you should check it once every couple of months. How Do I Check My Grill for Gas Leaks? Using a clean pastry brush, sauce brush, or paint brush, apply a 50/50 solution of water and dish soap to the gas hose and its connection points. Check for leaks. If there are leaks, you will see growing bubbles forming at the source of the leak. What Do I Do If There's a Leak? If you detect a leak on the surface of the hose, you should replace the hose immediately. Do not use your grill until the hose has been replaced. If you are looking for a new hose or regulator, you can buy it from us here.